Size: 325 sq.ft. - 1420 sq.ft. Zahra Breeze Apartments were launched in mid 2016. The project is located next to the Zahra Townhouses. The two low-rise buildings will consist of studio, one, two and three bedroom apartments. Town Square is thoughtfully crafted for every lifestyle, wether you're a young professional, growing family or established Dubai resident. Inspired by the liveliest quarters of the world's greatest cities, Town Square is a vibrant community offering abundant amenities for healthy living and unceasing entertainment, and a vast choice of shopping with more than 600 retail outlets. Completion is scheduled for September 2018. 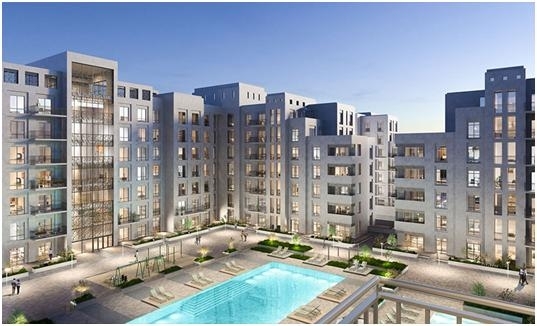 Zahra Breeze Apartments is the upcoming residential project in Town Square by Nshama offering studio and 1, 2 and 3-bedroom. The Apartments are surrounded by a lush green view with the boulevard parks outside. Zahra Breeze podiums covers sports facilities.lifestyle features such as stretches of greenery in forms of community parks, outdoor areas and basic facilities such as health centres, malls, retail stores, restaurants, schools and more.Living and dining areas offer abundant light while bedrooms are furnished with glazed porcelain floor whereas master bedrooms have an en-suite bathroom. The open layout kitchens has scratch and stain proof prep counters, overhead cabinets and glazed porcelain tile flooring. NShama has been offering sustainable world-class sophisticated communities. It is a leading real estate group and heart and soul of the Dubai residential community.Nshama Properties vision is to bring a new lifestyle options to Dubai that transforms the lives of peopleby offering mega communities for families but will also provide a full-fledged, thriving range of lifestyle developments like restaurants, hotels, cafes, play areas, educational institutes, community parks, health centers, malls, retail stores and more.Nshama Builders have great presence in Dubai Infrastructure with some of the most beautiful buildings in all over Dubai&UAE. Nshama Properties is the one of largest real estate company and still growing with lots of projects under construction. Zahra Breeze project is being constructed within the huge community project - Town Square, Dubailand, United Arab Emirates. Nshama Zahra Breeze is loaded with features like Spa, Swimming pool, Gym, Jogging Track, Restaurants, Community Gardens,Biking Trails, Nearby Shopping Mall, Hospital, School, Skate Parks, Covered underground parking, Basketball Court, Tennis Court, Football Field, Retails and many more. Schools – Raffles Primary School, Bradenton Prep School, Victory Heights Primary School, Jumeirah English Speaking School. Hospitals –Mediclinic, Saudi German Hospital, Al Zahra Hospital, Nice Care Medical Centre (NCMC), Blue Oasis Veterinary Clinic. Metro Stations –Sharaf DG Metro Station, Dubai Internet City Metro Station, Mall of the Emirates Metro Station.